Dressed in a red t-shirt and black shorts—the colors of his favorite football team, Manchester United—Zimbabwean journalist Itai Dzamara left his home in the working-class Glenville suburb of the capital Harare on March 9, 2015, and headed to his local barbershop. “He didn’t say anything [in particular], he just said: ‘I’m going to have my haircut, I’ll be back,’” Dzamara’s wife, Sheffra, tells Newsweek. But Dzamara did not return. And his family has not seen him since. The outspoken critic of Robert Mugabe’s government and father of two young children was snatched from the barbershop and forcibly disappeared in the southern African country, where speaking up against the government can have dire consequences. After more than a year of silence from the government, a single, grainy photo has brought the case back into the national consciousness. Dzamara’s brother, Patson Dzamara, claims the photo, which he says he got from someone within Zimbabwe’s state security apparatus, shows the activist in detention. In it, a masked figure sits with their hands bound behind their back against a black backdrop in an undisclosed location. Patson says he is “100 percent” sure that the image is legitimate, but Newsweekwas not able to independently confirm its authenticity. The brother of the abducted activist is using the photo to put pressure on the government, saying that he knows for sure Dzamara is being held in Zimbabwe and that he hopes to reveal more information on his brother’s precise whereabouts soon. The photo has reportedly been discounted by legal experts, although their claims were published in the state-owned Chronicle newspaper, which tends to be favorable to the government. Sheffra, however, is convinced it’s real. The image gives her a slim glimmer of light after she has spent more than a year completely in the dark. “That picture gave me hope that maybe my husband is still alive and maybe he’ll be released soon,” she tells Newsweek. A journalist and opposition campaigner, Dzamara, 36, wanted to mobilize young Zimbabweans against what he saw as the deplorable state of governance in the country, which Mugabe has ruled imperiously since independence in 1980. He held regular sit-in protests in Harare’s Africa Unity Square and the movement he started has garnered more than 10,000 likes on its Facebook page. Dzamara received the backing of Morgan Tsvangirai, Zimbabwe’s main opposition leader and ex-prime minister who has challenged Mugabe at several elections. In 2014, he personally delivered a petition to the president’s office demanding that Mugabe resign, an action that made him a target for several beatings by security forces. The state of affairs in Zimbabwe lend themselves to protesters in need of a cause. The country’s unemployment rate has been estimated as high as 80 or 90 percent, though the government’s statistics agency put it at just 10.7 percent in 2011. Zimbabwe’s economy is growing at a sluggish rate of less than 2 percent, while a U.S. dollar shortage has raised fears that the government could be planning to reintroduce the Zimbabwean dollar: the domestic currency became practically worthless following massive hyperinflation in 2008-09 which saw the price of bread reach 10 million Zimbabwean dollars. The country is also experiencing its worst drought in decades, leaving millions of people in need of food and forcing Mugabe to declare a state of disaster in some parts of the country. On the day of his abduction, Dzamara was approached by four unidentified men who asked him to confirm his identity, according to Patson. When he did, the men accused him of livestock theft and handcuffed him before bundling him into an unmarked car. His abduction left Sheffra to care for the couple’s two young children, an 8-year-old boy and 4-year-old girl. 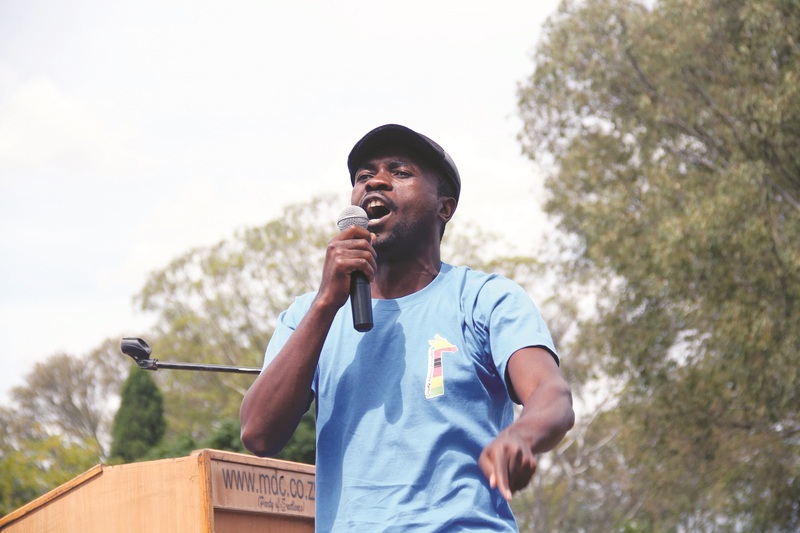 Dzamara’s activism has led to widespread accusations that his abduction was the work of Mugabe’s government. The Zimbabwe National Army has flatly denied that it played a role in Dzamara’s disappearance, calling Patson’s allegations “totally false and a figment of his own imaginations.”Newsweek contacted the Police General Headquarters in Harare on multiple occasions for a comment on progress made in finding Dzamara, but received no reply. Newsweek also contacted Zimbabwe’s ex-information minister and current higher education minister Jonathan Moyo—who suggested to the BBC in May 2015 that Dzamara may have disappeared across Zimbabwe’s “porous borders” but recently said he was probably abducted—but received no response. During Mugabe’s 36-year reign, the ruling Zanu-PF party has faced accusations of unnecessary force against political opposition. In the election year of 2008, at least 193 Zimbabwean citizens had been killed and many others abducted in political violence targeting opposition supports, according to the U.S. State Department. The 92-year-old president actually lost the first-round of the election to Tsvangirai but won by a huge margin in the second round. Tsvangirai, who has been arrested on numerous occasions during his political career, recently led thousands of supporters of his Movement for Democratic Change (MDC) through the streets of Harare. The demonstration was the largest opposition gathering in years in Zimbabwe—previous protests have been met with brutal force by security forces. It’s also not uncommon for political opponents to go missing. MDC activist Tonderai Ndira disappeared in May 2008, weeks before the second round of voting in the election. His mutilated body was found just over a week later, making him the 43rd opposition activist confirmed to have been killed during the fractious election campaign. Paul Chizuze, a human rights campaigner who investigated the disappearances of others in Zimbabwe, left his home in the country’s second city of Bulawayo on February 8, 2012 and has not been seen since. Jestina Mukoko is one of those rare activists who have been abducted by state agents and later released. The director of the Zimbabwe Peace Project, a domestic human rights group, Mukoko, 49, was taken from her Harare home on the morning of December 3, 2008, wearing only a dressing gown. Like Dzamara, Mukoko was taken by unidentified assailants in an unmarked car to an unknown location, where she was held for 21 days and tortured, beaten on the soles of her feet with rubber and metal truncheons and forced to kneel on sharp gravel for hours on end. Mukoko’s abduction received international attention, with former British Prime Minister Gordon Brown and ex-U.S. Secretary of State Condoleezza Rice among those who called for her release. But the Zimbabwean government initially denied any knowledge of her disappearance. On Christmas Eve 2008, she says, she was dragged before a court and was accused by her abductors of recruiting armed youths to the MDC in a bid to overthrow the government, a charge she describes as “absurd.” In March 2009, three months after she was first abducted, Mukoko was granted bail and in September 2009, Zimbabwe’s Supreme Court ordered a permanent stay of criminal proceedings against her. On March 13, 2015, four days after Dzamara’s abduction, Zimbabwe’s High Court ordered the police and Central Intelligence Organization (CIO) to search for the missing activist. Zimbabwe’s security services are renowned for the prominent position they hold within the country’s political sphere and the CIO has an extensive network of informers and agents across the country, along with a formal staff complement believed to be around 3,000. Yet despite its comprehensive reach and being required to report on Dzamara’s case on a fortnightly basis, there has been no visible progress towards finding him, says Deprose Muchena, Southern Africa director at Amnesty International. “This is absolutely puzzling for a very sophisticated state security machinery that we’ve seen operating with efficiency when it is doing what it does best,” says Muchena. Despite Dzamara’s disappearance and the brutal history of Mugabe’s regime, the opposition appears to be finding its voice in Zimbabwe. A Harare pastor called Evan Mawarire—who has campaigned alongside Patson for Dzamara’s release—kickstarted the #ThisFlag hashtag on social media in April, following a video in which he berated the government for separating the citizenry from the “promise of [Zimbabwe’s] flag.” The video has since been viewed 36,000 times. The MDC has promised more protests in the wake of the recent mass demonstration and Dzamara’s Occupy group has continued its public action, even as scores of its members are being arrested. For Patson, the seeds of opposition are signs that change may be coming to Zimbabwe. The country’s next general election is in 2018, and Patson says that the ultimate goal of the movement started by his brother is for Mugabe to be removed from power. “We don’t see Mugabe stepping down… What we want to do is to make sure that we mobilize people and encourage people to look beyond Mugabe’s failure and actually look to the new Zimbabwe that is dawning on us,” says Patson.